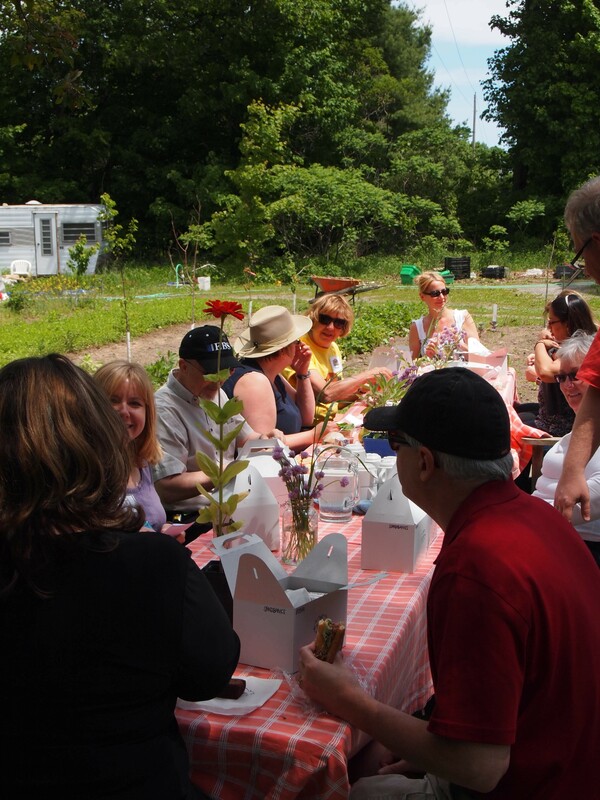 A highlight of our All Day Cheese Tour was stopping at Vicki’s Veggies for a picnic lunch. We arrived quite hungry from a busy morning of touring, and were happy to take a seat at the picnic tables that had been set up on Vicki Emlaw’s and Tim Noxon’s property. Here we savoured a delicious box lunch from Prince Edward County’s East & Main Bistro, while free-range chickens wandered around us looking for handouts. During our lunch, Vicki Emlaw provided a history of the farm business that she and her husband run. After spending a couple years at university, Vicki spent twelve years travelling the world. She would return in the summers to work evenings in local restaurants, and would spend her days working in her mother’s garden. At a party one night, she met a local carpenter whose recent hand injury was preventing him from being able to can his home-grown tomatoes. She volunteered to help him, and the rest is history. Now the couple lives on an 8-acre property where they grow non-certified organic mixed vegetables, herbs, fruits, flowers, mushrooms, and eggs. They sell their produce from a roadside stand at their farm, as well as two Toronto farmers’ markets (Evergreen Brickworks and Wychword Barns). They also supply local County restaurants. Vicki’s Veggies holds two major events each year. The first is the Heirloom Tomato Seedling Sale that takes place on the May long weekend, where buyers can select from over 200 varieties of heirloom tomatoes. (Vicki has collected these tomato varieties from a range of sources, including local farmers who developed their own varieties to meet the very specific conditions of their farms.) Then on the Labour Day weekend in September, Vicki’s Veggies holds their annual Heirloom Hurrah Tomato Tasting, a free event where visitors can taste over 100 varieties of heirloom tomatoes. In between these events, visitors can come to the farm where they can buy fresh vegetables and preserves such as canned tomato sauce. For those who want to save money and help the farm in the colder months, Vicki’s Veggies also sells Veggie Bucks, which are an innovative twist on Community Supported Agriculture (CSA). Customers buy booklets of vouchers to redeem throughout the year, and the earlier they buy the vouchers, the more they save. This gives CSA members added flexibility for purchasing their vegetables, and provides the farm with revenue through the early part of the season. It’s a very smart idea, and one that would be great to see implemented by CSA’s in the Ottawa area!